There are certain colors that food just isn’t supposed to be, particularly blue and black. Admittedly there are some black foods that most people don’t have a problem with, such as licorice or caviar. But when a food that isn’t normally black suddenly is? It’s really hard to convince yourself that it’s OK to eat – some sort of primal response to Bad Food. 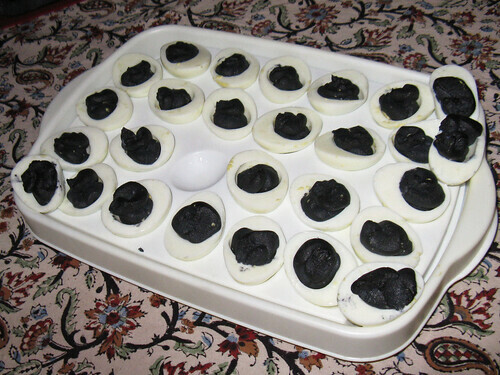 Someone brought these black devilled eggs to a Halloween party we went to, and it seemed to take the guests quite a while to work themselves up to trying them. Once they did, though, they disappeared rapidly. Is it the “blackness” of the food, or the “differentness” of the color? If the deviled eggs had been hot pink or day-glo orange, would they have been any more appetizing? And of course, there’s the classic “Green Eggs & Ham”. Well, true. If the egg filling had been day-glo green I might have felt the same way. Although black is special, you never know what might be lurking in there.